Reuters reports on the growing number of Chinese vendors that have already begun taking orders for the "iPhone 5", despite the fact that Apple has made no announcement about the next-generation iPhone's specs or availability. Sellers on Taobao, a unit of Alibaba Group, are accepting orders for the iPhone 5, in some cases asking for a deposit of 1,000 yuan ($160) for the new phone. One seller, "Dahai99888", who started accepting pre-orders this week, is asking for full payment upfront, at a cool 6,999 yuan ($1,100). Taobao sellers that Reuters spoke with said they planned to buy the iPhone 5 in Hong Kong or the United States and then bring it to mainland China. Apple products are often available in Hong Kong before they are released on the mainland. The report also points to a surge in the number of cases for the next-generation iPhone being sold through similar channels. But while case makers have sometimes possessed accurate advance information in the past such as with the iPad 2, they were less successful with their production of iPhone cases for a tapered form factor last year. Increasing activity surrounding the next-generation iPhone comes as KitGuru posts a number of photos of what it claims is the actual device. But while the overall form factor is consistent with previously-leaked photos and details, a number of aspects of the photos including a very rough appearance and a lack of a visible LCD display or opening for one in the front panel suggest that the item is simply a physical mockup based on circulating information. The source of the mockup is unknown, with KitGuru simply noting that it was spotted "in the Far East", and it may represent a case maker's model for advance production based on leaked and rumored details. 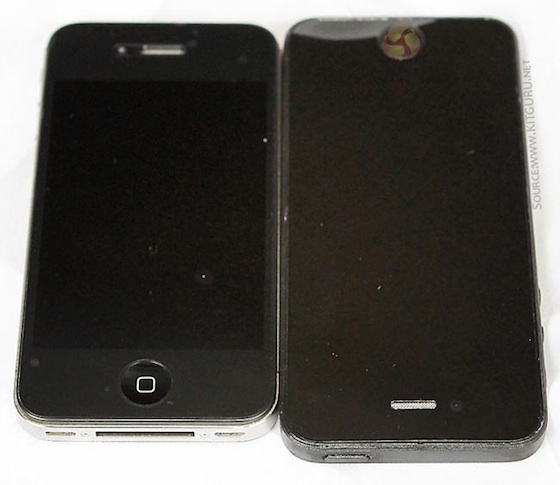 Similar internal molds claimed to be for the next-generation iPhone and "iPad mini" surfaced earlier this week. I so hope this is not the next iPhone, just because I want to see the third party accessory vendors scramble to get something to market when a completely different form factor is released. Is that evil? Headphone jack on the bottom?! GROSS. Sorry Left-Handers. I hope Apple really doesn't put the headphone jack on the bottom. The FaceTime camera is in a different location on this mockup compared to the previous leaked parts. so, Apple is now using cast iron to make iPhones? I welcome this. If my phone is in my pocket I can just slide it halfway out to change the song. If iPhone 5 isn't radically different, Apple will fall further behind in the mobile market. What does this have to do with being left-handed? It's not in the way either way - or are you gripping it top-to-bottom? I don't.